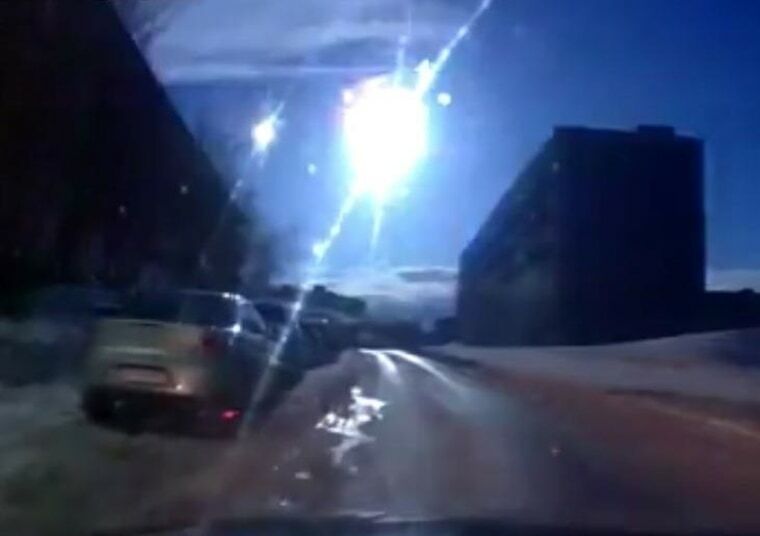 Dashcam videos from the northwestern Russian city of Murmansk show a fireball explosion much like the meteor that lit up the sky over Chelyabinsk in Siberia last year. The impact of Saturday's blast wasn't nearly as dramatic, however. The Chelyabinsk meteor blew out windows, triggered car alarms and injured more than 1,200 people. In contrast, Gazeta.ru reported that no sound of an explosion was heard from Saturday's meteor, although it was sighted from Murmansk as well as other cities on Russia's Kola Peninsula. "Visually, it's a bright one, but not unusually bright," NBC News space analyst James Oberg said. An online report from Russia's LifeNews channel said emergency officials received no alarm calls about Saturday's fireball. It also quoted an astronomer in Murmansk, Viktor Troshenkov, as saying that the fireball could have been part of the Lyrid meteor shower, which reaches its peak next week. The FlashNord news service has pulled together several views from street cameras as well as dashboard cameras. In one of the dashcam videos, the automobile's passengers can be heard marveling over the flash. Many cars in Russia are outfitted with dashboard cameras, primarily to document traffic accidents and roadside shakedowns. That makes it more likely that transient phenomena like meteor flashes will be caught on video. Such dashcam views helped researchers reconstruct the timeline for last year's Chelyabinsk explosion. A similar fireball caused a stir last month in Russia's Yakutia region. Astronomers say the Chelyabinsk blast of Feb. 15, 2013, was caused by a 60-foot-wide (19-meter-wide) asteroid that blasted through Earth's atmosphere, releasing the energy equivalent of 500 kilotons of TNT. They estimate that kind of explosion occurs every decade or two.